Android Central and their sister site TiPB put together that fancy little chart above which compares the new iPhone 4 to the top Android devices on the market. 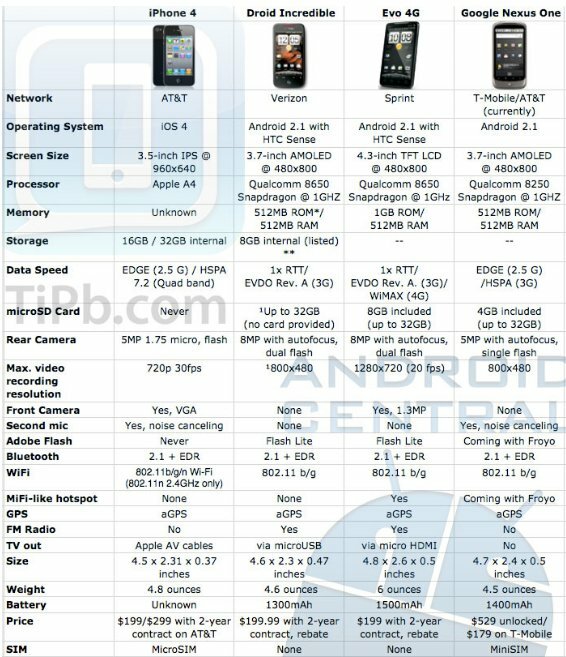 While it doesn’t stand up at all to the EVO (in more ways than one), we still wonder if the iPhone 4 could even hold its own against the Droid Incredible or Nexus One? At first glance, you could give it a slight edge because they both lack front facing cameras, but then you quickly realize it has no expandable storage, no Flash, only a 5MP camera, and a smaller screen. Hmmm. Yikes? While I usually avoid fueling the hatred between the Apple fanboys and the Fandroids, it’s pretty hard not to chuckle a little bit today when you roll with the good guys. Who’s hosting the Android party tonight? I’ll buy the first round.